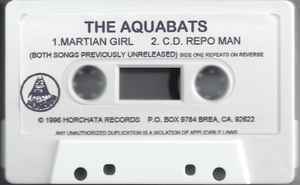 Teaser release of tracks from The Return of the Aquabats. However, it is not the same as the final mix for the release. This was given out to promoters, venues, and labels as a promotional piece. The release has no J-card and was packaged in a clear cassette case with white photocopied labels with band and song names on a white cassette. While this was released under the Horchata label, it did not have a catalog number and was not considered to be an “official” release.